Previously, we’ve discussed on a high level why being data-driven and results-driven is so important for effective content marketing. However, I realized that while a high level purpose and strategy are crucial for effective content, tactics will ultimately be instrumental in translating your efforts from plans to reality. This article is where the rubber will meet the road in terms of implementing a results-driven approach to content. 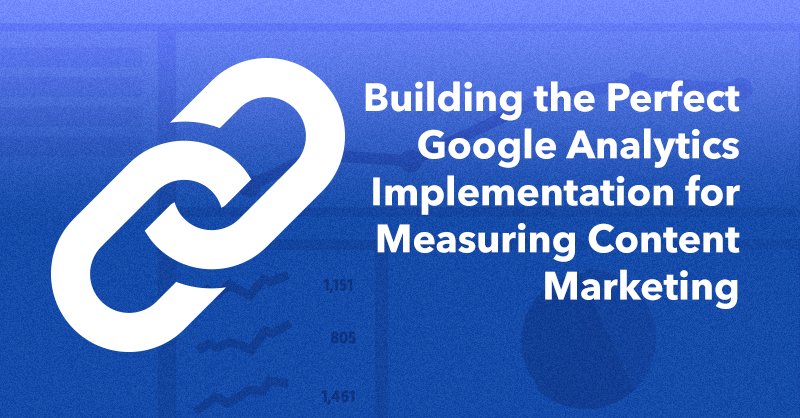 Learn how to tweak Google Analytics’ out-of-the-box setup to construct long-term results-tracking as well as short-term A/B tests. All of these considerations will your organization stay grounded and in touch with the data as your content strategy develops. Devise a Link-Tagging Protocol & Stick To It! When it comes to quickly and easily working with external referral sources that fall outside Google Analytics’ default break-down, UTM tagging is absolutely essential. UTM tags allow you to create a custom URL (using a tool like Google’s URL Builder) that stores unique information about various elements of a link. Building links like these allows you to take one link and generate multiple variations based on where you have placed the link itself within your content externally back to your web properties. For example, if I wanted to run two separate ads on Facebook for a given piece of content and track each ad’s performance on my end, I would generate a slightly different UTM link for each campaign pointed at my site. Both of these links would take the user to the same place, but when I opened analytics I’d be able to look at them separately. Most of the granularity you will need to accurately measure and evaluate your content’s impact will not be accessible unless you actively tag and categorize links. 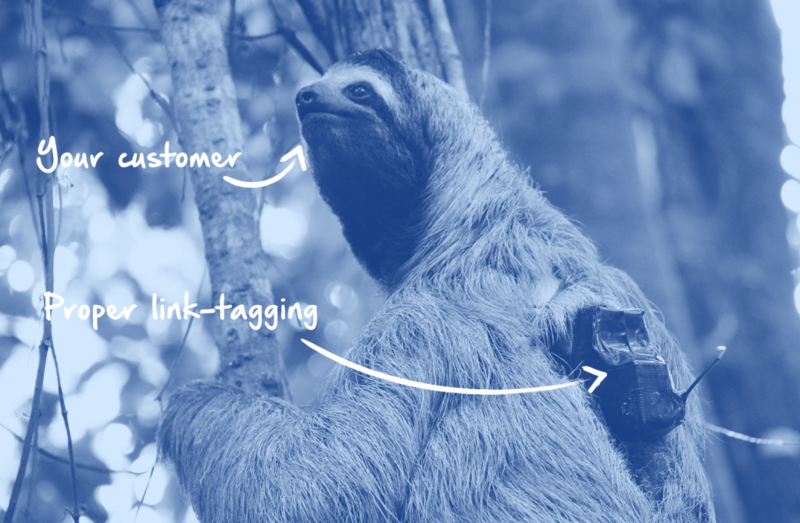 The best way to approach and sort traffic from various sources and campaigns is to construct a simple hierarchy and be consistent with how you design your tagged links. This hierarchy will work on two conditions, as long as you understand and only if you stay consistent with it. Update: This article originally suggested tagging your links on your own site with UTM parameters and that suggestion was inaccurate. According to my friends over at LunaMetrics, if you tag links on your own website with UTM parameters, “Google Analytics records a new traffic source and starts a whole new visit. So now you have at least two problems: You’ve split what was really one visit into two visits, skewing your data. And you can’t tie the original click on a link directly to the conversion, because the conversion happens in a separate visit.” In summary, only tag external links with UTM parameters. 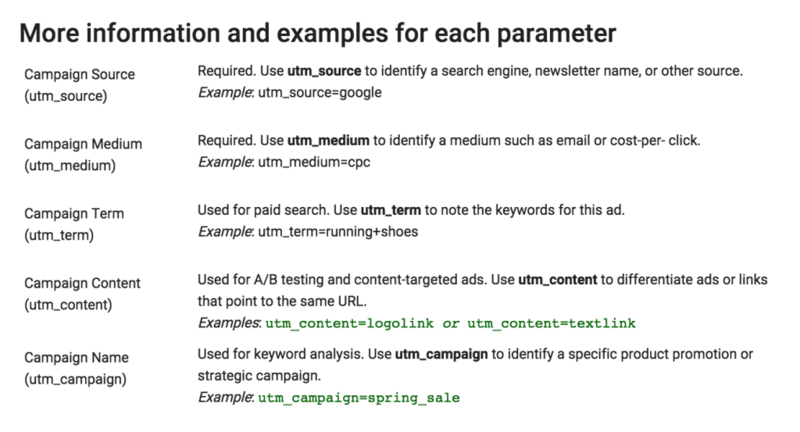 While UTMs work very well for tracking external links, use your own campaign parameters or segments to easily track activity across your content internally. Due to the nature of content marketing, much of your selling will be done by handing off a user from a non-sales content page to a more sales-driven product page. Tracking this user’s behavior along the funnel will be discussed later on in this article: but often times, the place this journey will start will be from an internal link. For example, if your organization has a content hub or a blog on your website with engaging content meant to entertain, educate or serve both purposes, it should be tracked effectively to understand the impact that content is having on driving qualified traffic to take action across the rest of the company’s website. Consider adding links within the blog articles themselves, soft-sell ads around this content and light CTA’s at the end of each post to drive readers to other relevant content, to shop your products and services and visit other essential parts of your website. Attribute how often these links are clicked by adding your own campaign parameters the end of the URL of each target link to reference this activity in Google Analytics, similarly to UTM parameters. Customize the parameters you’re adding to the end of the URL on each of these links, again being consistent, by adding a ? followed by the appropriate label that will help your team identify the activity associated with that link in the Site Content report. What makes tagging these links with your own campaign parameters critical here is that they separate the content-driven traffic to the product page from all of the traffic driven from other sources and do so in a way that is easy to cross reference in Google Analytics. Another useful technique for attributing the success of your content efforts is using segments with purpose in GA. Setting up a segment allows your business to see when a session includes a pageview of a specific area of your website like /blog/. The segments will show you 90 days worth of data about users who interact with the blog and then go on to either purchase or convert on any goal set up in your Google Analytics. If you have a particular goal you’d like to prioritize, you can edit them and change the goal they’re looking for. The beauty of these segments is that they can be viewed in any report and customized to match your needs. My suggestion is to set up the following segments, but obviously there are many variations to choose from. Here are the manual instructions for each, but I also included Segment Configurations, which means by clicking the included links you can add these segments to your Google Analytics account automatically. User’s Who’ve Converted and Ever Visited the Blog: To setup this segment, visit admin in GA and choose Segments from the Personal Tools and Assets menu. Choose New Segment, select Conditions under Advanced and then choose Page, Contains and then add /blog/. This input may different depending on what the URL of the section of the site you’re trying to analyze. Then choose Goal Completions, Per user, greater than (>) and then enter 0 in the field. Label the segment accordingly. 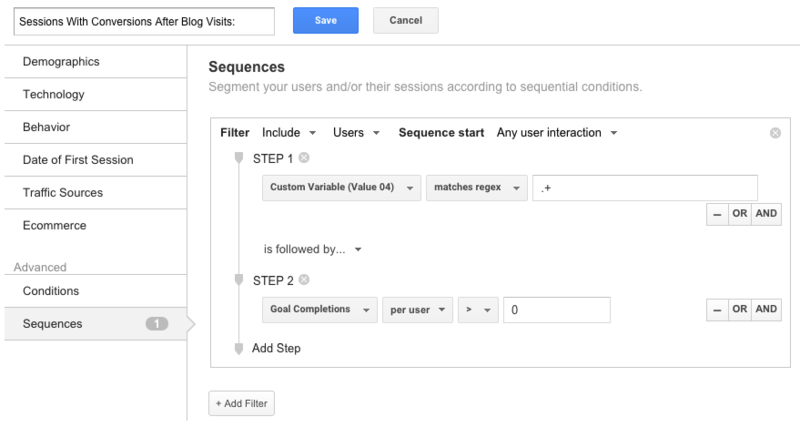 Sessions With Conversions After Blog Visits: To setup this segment, visit admin in GA and choose Segments from the Personal Tools and Assets menu. Choose New Segment, select Sequences under Advanced and then choose Step 1, Custom Variable (Value 04), Matches Regex and then add .+. Then Choose Step 2, Goal Completions, Per User, Greater Than (>) and then add 0. Label the segment accordingly. Users Who Visit the Blog, Then Convert: To setup this segment, visit admin in GA and choose Segments from the Personal Tools and Assets menu. Choose New Segment, select Sequences under Advanced and then choose Step 1, Transactions, Per Session, equals (=) and then add 0. Then choose “And” Goal Completions, Per Session, equals (=) and then add 0. Then Choose “And” Page, Contains and then add /blog/. Add Step 2, Choose Transactions, Per User, Greater Than (>) and then add 0. Then choose “And” Goal Completions, Per User, Greater Than (>) and then add 0. Label the segment accordingly. Once you have this data, you can start to gain all sorts of insights about how well your content is performing; and taken in tandem with e-commerce data, will help shed light on the ROI of your content efforts vs what other marketing channels are engaging your customers. Implementing this step well will require you to really understand exactly what you want to measure and try and put systems into place that will assist in gathering clear data while not disturbing the quality of your content. If done right, these internal CTAs or links to additional resources will not only help ground and orient your content marketing but can actually be a value-add as well. Depending on the specific goals of your site and expectations of your visitors, these win-win situations will look pretty different, but the one takeaway is to examine what you are trying to track, think about how to most efficiently track that behavior and see if that component can be worked into your content without disturbing users. I’ve mentioned many times that content marketing is a “slow-burn” marketing strategy. While there is overwhelming consensus that content marketing can drive revenue and help build brand equity, all of this takes time. Understanding the nature of content marketing’s contribution to sales (indirect) means looking past one of the more reasonable-seeming (yet fundamentally flawed) assumptions people make when measuring conversions. This assumption is that the interaction or behavior immediately preceding a conversion is the one that ultimately caused it. This might seem true (and may even be the case sometimes) but very often this assumption will paint a skewed picture of what is actually happening. 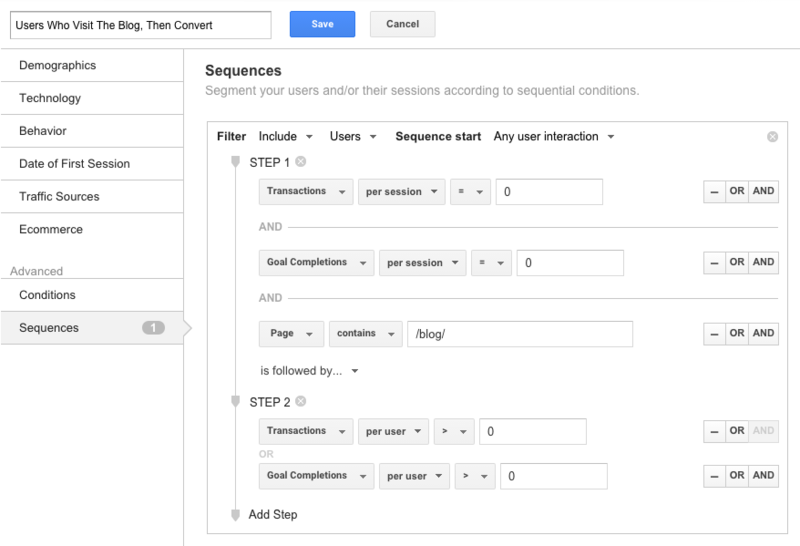 Using Google Analytics’ multi-channel funnels tool will help you get a broader, more holistic view of where content factors into the conversion process. Taking full advantage of this measurement capability will require you to deeply consider what a path to conversion might look like, where content marketing will fit into this path, and how to set up intermediary events to better measure this journey. For example, it might make sense to not have your content push users directly to buy (an interaction that requires more exposure) but rather may prompt them to check out more content or to sign up for an email newsletter instead. Conversions from one of these intermediary channels might be credited with the last-touch conversion, but you will still be able to see the overall path the user took and determine whether or not your content is driving more sales in the long-run than any of these channels alone. Understanding the entire path to conversion will not only give you a better picture of how customers discovered your brand, but also how many interactions with content it took to convince them to make a purchase. This overview will also help you more accurately assess the effectiveness of each step and identify weak links in the chain from first-touch to last-click. This last step might require a considerable period of prior analysis, but (if done correctly) will dramatically enhance your ability to make strategic decisions that take your bottom line into account. After gathering multi-channel conversion data, and doing a bit of number crunching you will be able to roughly calculate how much tangible value can be assigned to a singular non-monetary event. For example, if you know that for the segment of users who click on any given piece of content, 5% will sign up for your newsletter and of those 5% roughly 25% will convert within three months, and of these conversions the AOV will be $50.00, you can start to get a sense of how much money is reasonable to spend on creating content, acquiring visitors and blasting emails. In addition, breaking the process out in this way can call your attention to weak links in the cycle and let you get a sense of where your improvement efforts can make the biggest impact. 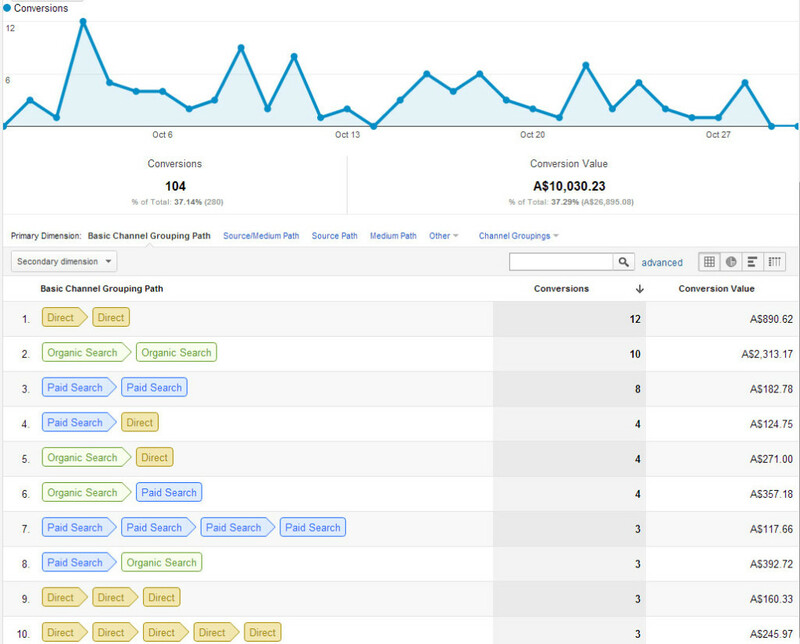 To help save time, set up shortcuts in Google Analytics that will take you directly to any report you’ve created. All of this setup work might seem like a bit of a drag, but once you understand the degree of power it gives you and time it saves in the long run, there will be no denying that it is absolutely necessary for any content marketing effort. 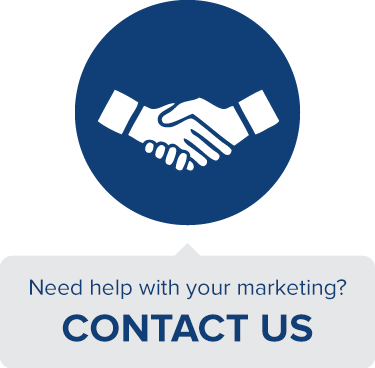 One last note: the wide variety of organizations and goals make it too complex to provide steps for every situation, but if you want more help tracking and setting up a more effective content marketing strategy, we’re here to help.